Niagara is a world famous wine-growing region and home to countless award-winning wineries. 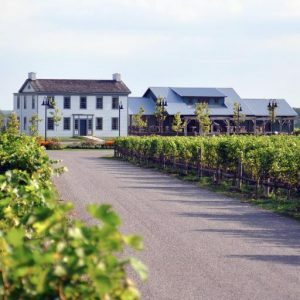 Embarking on a winery tour is the perfect way to experience some of the best wineries without having to worry about transportation or planning, and Falls Avenue Resort’s Niagara Winery Experience package takes care of it all. The package includes accommodations at the Sheraton on the Falls or Crowne Plaza Niagara Falls-Fallsview, two wine tour and tasting passes at four wineries with a guided tour by Magnificent Tours, three Fallsview dining gift cards for The Rainbow Room by Massimo Capra, Windows by Jamie Kennedy Fresh Grill & Wine Bar, and the Fallsview Buffet Restaurant, and spa credit for the Christienne Fallsview Spa. Local legend suggests that Niagara-on-the-Lake is a haunted town, with many reports of paranormal activity happening at the Fort George National Historic Site – the site of several deadly battles during the War of 1812. You can find out about the hauntings first-hand by touring the fort by candlelight at night, with guided ghost tours being offered on Sundays at 8:30pm from May to June. The fort also offers special Halloween ghost tours in October and additional tours on Tuesdays and Thursdays from July to August. A great way to get active while exploring some of Niagara’s best wineries is by embarking on a winery bike tour. Available through a number of different tour companies, cycling around Niagara-on-the-Lake and stopping for wine and food at award-winning wineries has become a popular and quintessential Niagara experience. Some popular winery bike tours include “the ultimate wine, beer & foodie bicycle tour” offered by Grape Escape Wine Tours, the “afternoon wine tour” from Zoom Leisure, and numerous Sip n Cycle tours offered by Niagara Wine Tours International. Double Deck Tours Ltd. operates a number of red double decker tour buses that take you around Niagara Falls to see and experience a number of the city’s top destinations and landmarks such as the Horseshoe and American Falls, the Niagara Glen, Floral Clock, Dufferin Islands, Hydro Power Plants, and much more. And when you book a Niagara Falls Deluxe Tour you will also receive admission to Journey Behind the Falls, Whirlpool Aerocar, and Hornblower Niagara Cruises for a well-rounded Niagara Falls experience.